Super Stoked!! 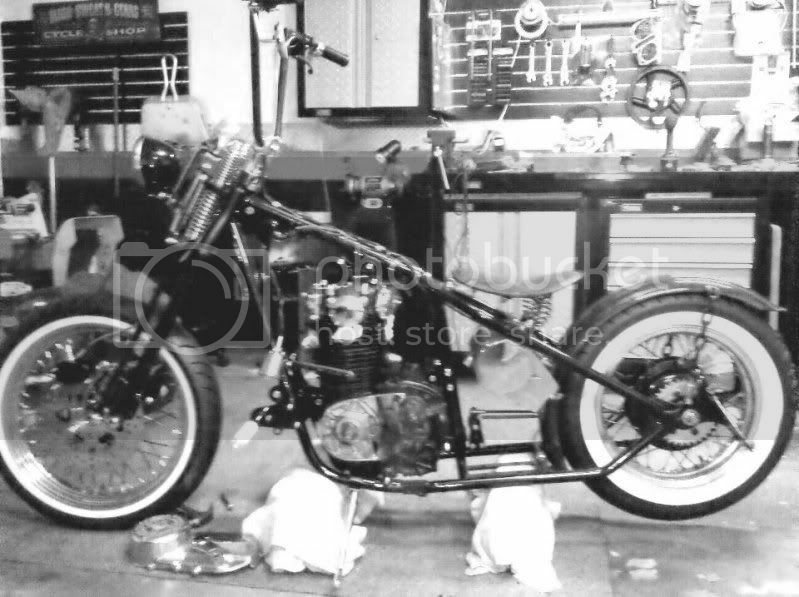 KILLER XS 650’s coming up!!! Sick bike I like how you wrote on the tires. How’d you do that? White letters make it hot, neat tank too. Very nice ride. The foot pegs too look very original. My cousin painted the Goodyear emblem on the tires of his ’68 VW Beetle freehand with white-out. You should be able to get paint that will stick to the tires at an auto parts store. I want more details on the rear frame mods and shock mounts. Woohoo, that is one sick/great looking motherbeeping ride ! Love it. Only thing I would change would be to stretch that tank 3 inches or so, but spot on otherwise! Ordinary latex house paint will stick to rubber. Nice ride, what everyone before me has said, the Jaapnese make their own rules with this stuff, way cool. what rear shocks are those? Killer scoot dude! i want to know where you got the mini bullet signals . and where did you mount your coil. ?